Pendleton is located in Umatilla County northwest of La Grande, between Echo and the adjacent Umatilla Indian Reservation along Interstate 84; Also situated on the banks of the Umatilla River, near Mckay Reservoir. The towns site was selected between Birch and Wildhorse Creek to be named Pendleton in honor of Senator George H. Pendleton of Ohio (1864 Vice presidential candidate for the United States). 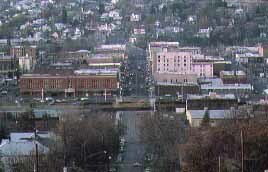 Pendleton was officially incorporated on October 25, 1880, with a population of 730. In 1910 local attorney Roy Raley, who had an excellent flare for theatrics, decided to have a rodeo after harvest and the famous Pendleton Round-Up was born. Held in September, this four day event includes daily rodeos and the Happy Canyon Indian Pageant, as well as the Westward Ho Parade. Downtown, visitors can see the restored 1889 Seth Thomas Clock tower. There is also a Pendleton, South Carolina. Agriculture and livestock are the main industries.